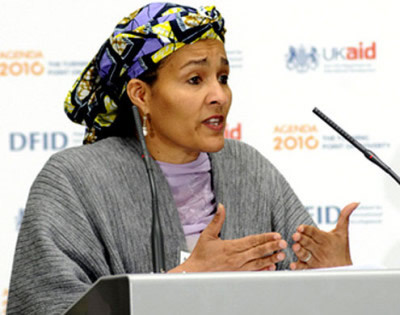 The New UN Secretary-General, António Guterres, on Thursday announced Nigeria’s Environment minister, Amina Mohammed, as his Deputy Secretary-General. Guterres made the announcement through the spokesman of the Secretary-General, Mr. Stephane Dujarric. Guterres also announced the duo of Ms. Maria Viotti of Brazil and Ms. Kyung-wha Kang of the Republic of Korea into high-profile positions at the UN. He said, “I am pleased to announce that I will be appointing Ms. Amina J. Mohammed of Nigeria as my Deputy Secretary-General, and Ms. Maria Luiza Ribeiro Viotti of Brazil as my Chef De Cabinet. Mohammed, the current Nigeria’s Minister of Environment, served as UN Under-Secretary-General and Special Adviser to outgoing Secretary-General Ban Ki-moon on Post-2015 Development Planning. She is also the UN Secretary-General’s Global Sustainability Panel, the African Women’s Millennium Initiative, Girl Effect and the ActionAid International Right to Education Project. Guterres had hinted on Monday after he took the oath of office that gender parity would be top of his agenda as the UN scribe. He said, “I think that one very important element of the agenda would be to give a clear signal that gender parity is a must and so in the appointments I will be making. “This is a very ambitious agenda, an agenda that must be for both woman and man, and that is why parity is so important in our reform perspectives. Guterres, succeeds outgoing secretary-general Ban, who bows out on Dec. 31, 2016 after a decade of two terms, while the new secretary-general assumes office on Jan. 1, 2017, for the next five years. Wow! This is good to hear. UN is setting a laudable pace for women leadership. Congratulations to Hajia Anima Mohammad. I support you ma'am and wish you a significant leadership. Leadership by example! Congratulations Mrs.Amina! Congratulations Nigeria! Congratulations UN! Congratulations to all women empowerment advocate!!! I am happy UN is setting a very good example. Works speak louder than words! This is one of the big step that came through which in turn shows the baisc legality of empowering women. Mrs Amina deserves to be where she is and it is very evident being a womam she came through all the struggles and working for betterment. This society needs to believe in woman, that with the right opportunities,given they can create wonders. Congrats Mrs Amina for making us proud. Congrats Mrs. Amina - we're so proud of you. Your story is part of the larger women's stories across the world. Thanks for sharing! And congrats to Mrs Amina Muhammed. Exciting to read the Secretary General of the United Nations makes 3 or 4 major appointments in a day ALL WOMEN! And rightly he is confident about their competences for the jobs. May we continue to witness more and more women being promoted in their professions and their places of work.